We're bringing back last year's Throwback vibes and bringing you your annual winter dose of fly fishing films. 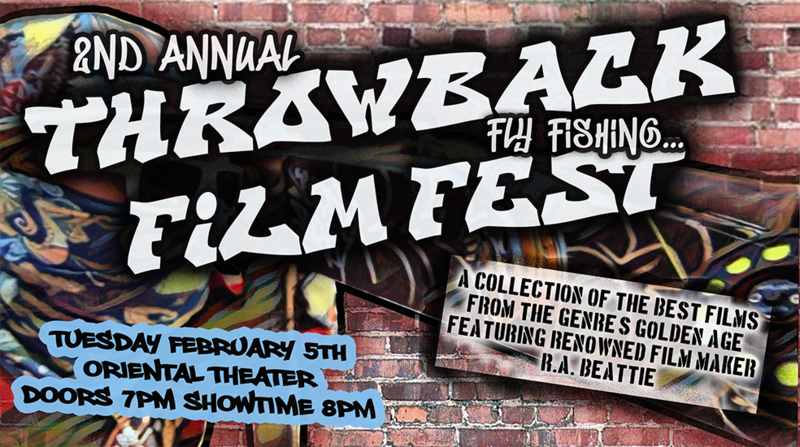 Trouts Fly Fishing is proud to announce the Throwback Fly Fishing Film Fest, presented by The Drake Magazine, Beattie Outdoor Productions, and The Fly Fishing Film Tour (F3T). Join us on Tuesday, February 5th at the Oriental Theater where we will be showcasing a collection of the best fly fishing films of the legendary Colorado-native RA Beattie from the Golden Age of Fly Fishing Film. From "When Guiding Goes Gangster" to "Off the Grid" to "The Arctic", RA has been pumping out some of the finest fly fishing films we've ever laid our angling eyes on. With RA in the house talking about some of his favorite moments and sharing his favorite films, it's bound to be a great time. As we did last year, ALL of the proceeds from the Throwback Fly Fishing Film Fest will be donated to Denver Trout Unlimited's (DTU's) commitment to raise the Denver - South Platte River's flows. Our goal is to raise $7500 in order to secure another acre-foot of water in Chatfield Reservoir. With some help from our amazing sponsors, R.L. Winston Rod Co., Yeti Coolers, Ross Reels, Simms Fishing Products, Fishpond, Abel Reels, and Costa, we will be raffling off some of the latest and greatest from these industry leaders. All of the proceeds from raffles will be donated to the conservation and improvement of the Denver South Platte. So, mark your calendar for February 5th, 2019 to help out our home waters, enjoy the company of some good friends and family (ALL AGES WELCOME) and we look forward to seeing you at the Oriental! Stay tuned to our blog for more details!